Zack and Amp get a serious surprise in the fifth installment of this intergalactic chapter book series by Nate Ball, the host of PBS’s Design Squad and Design Squad Nation. Zack and his alien friend, Amp, discover that leverage can be an Earth-saving thing when they build a rocket-launching atlatl! Zack McGee’s life has been filled with trouble since Amp, a four-inch-tall alien scout, crash-landed into Zack’s bedroom. But now it’s Amp’s turn to be in the hot seat. When his commander, Ohm, arrives to take Amp back home, the aliens feud. Amp has to get his cranky counterpart off Earth before they all end up in a world of trouble! 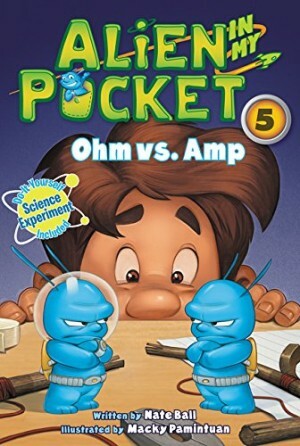 Like every book in the Alien in My Pocket series, Ohm vs. Amp mixes Common Core–aligned science, and safe, hands-on experiments with a hilarious story that young readers will love.